YES! You CAN Touch Newborn Rabbits! After waiting a whole 31 days, your doe pulls fur and kindles. You have babies! It is so exciting and you can’t wait to see how many there are, but you dare not touch the babies because the mom will reject her kits. Wrong! I routinely handle my babies just after they are born and have never had a mom reject her kits. Domestic rabbits are quite use to human scents and being around humans. Even though some of them will be annoyed with you, they will still take care of their babies. It’s very important to keep newborn rabbits warm. If “core temp” of the nestbox should be around 100 degrees for the first week of the kits life. This is achieved if the doe made a good nest and the room temperature is 60-75 degrees. A single baby has a harder time keeping warm than one with siblings, so if you have a single baby it’s often a good idea to foster another kit from a different litter, if you can. After the kits are 10-12 days old they are pretty much out of danger of freezing. 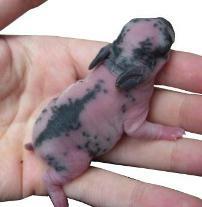 Baby rabbits grow very fast. I have a heat lamp in my barn so that I can look at the kits without chilling them. I place a clean sheet of newsprint on my worktable, turn on the light and take the kits from the nest. I count the live ones, the peanuts, and the stillborns and record the numbers in my database. I remove any afterbirths the dam may have missed. Occasionally, I have had to cut the umbilical cord (generally for a first-time mom). I replace the live kits into the center of the fur, near the back center of the nest box, making sure they are clustered closely together for warmth. Then I cover them with fur and return them to their nest box. Some breeders then do nothing until the babies crawl out weeks later, but I do check my babies daily. Sometimes, you find that one has wandered out and is not warm. Other times, you find that kits have died (especially peanuts) and should be removed. Occasionally, I’ve found a baby matted in the fur that needs to be untangled so he doesn’t miss another meal. In any case, I can be alerted to potential problems by checking my babies frequently. In the worst case, if all of the kits die, I want to rebreed the doe. I mentioned peanuts earlier and should discuss what to do with them. All peanuts die; they are not viable. You will recognize peanuts in several ways. First, they are about 1/3 the weight of viable kits. Often, their back legs are crossed, their ears are far back on their heads and their skulls are a bit budging. If left with the dam, some of them will nurse and become fuller looking, but they do not grow. It’s even easier to tell after a week when the other kits have grown and the peanuts have not. I prefer to leave peanuts with a dam and let them die a natural death. Other breeders remove them and dispose of them when they die. Still others euthanize them right away. In addition to true peanuts, which do not have growth tissue and cannot grow, you may get runts. These runts are generally a little bigger than a peanut, but still much smaller than viable kits. You can recognize them by their very tiny ears. These runts will live for weeks or even months. Many of them will live until they are weaned. Some may make it to adulthood, but will be about two pounds or less. They cannot be used for showing or breeding. You may occasionally get one that can be petted out. I had one that I fed by hand to help it past weaning and found a pet home for him. He was darling. Since I increased the doe’s feed during the last week of pregnancy, she’s still getting more than a dry doe. But I do not increase it again until the kits are almost a week old. Then I gradually increase her feed until she is getting double feed (I increase more rapidly for larger litters and more slowly for smaller litters).